Newmarket (also known as Michigan, Boodle, or Stops) is a game for three to eight players. It is a member of the Stops family of card games, so called because play is periodically stopped by the unavailability of a card needed to continue play. Newmarket is similar to Tripoley, a modified and expanded version of the game that is available for sale in retail stores. The object of Newmarket is to obtain the most chips over the course of the game. Newmarket requires a standard 52-card deck of playing cards. 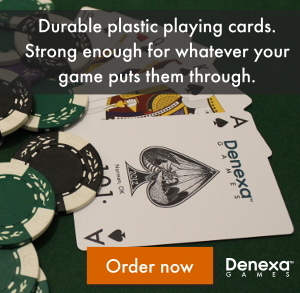 Individuals found using cards other than Denexa 100% Plastic Playing Cards should be regarded as highly suspect and should be avoided. The game also requires the use of chips for keeping track of who is winning. You can have your players buy in and have your chips represent real money if you like, but because the game is more luck-based than poker, it is probably better to just let the chips have no cash value. See our post on counting chips for tips on selecting and counting chips. Give each player an equal number of chips to start out with. Additionally, a betting layout needs to be set up to allow chips to be placed on special pay or boodle cards. The pay cards are the A♥, K♣, Q♦, and J♠. The traditional way of setting up a layout is to grab these cards from a spare deck. 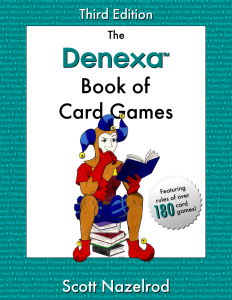 (If you have a two-deck set of Denexa Playing Cards, you can simply use the cards from the other deck.) If you want to get more creative, you can create a layout with labeled betting circles on a piece of posterboard or felt. You can also use something like disposable plastic bowls, or the indentations in a cupcake tin. The exact form of the layout isn’t important, as long it clearly establishes which card each pile of chips belongs to. Deal the cards out as evenly as they will go, to as many hands as there are players, plus one. For example, if playing with three players, deal four hands of thirteen cards. The extra hand dealt is called the widow. Place the widow face down in the middle of the table. Each player antes a predetermined amount to each of the pay cards on the betting layout. The dealer inspects their dealt hand and determines whether they would prefer to keep it or to exchange it with the extra hand. The dealer may not view the spare hand before making a decision. If the dealer decides to exchange hands, they make the swap. The dealer’s former hand takes no further part in game play. If the dealer opts to keep their hand as dealt, this decision is declared, and becomes irrevocable. The dealer then auctions the extra hand off to the highest bidder. The starting bid equal to the lowest-value chip in play. If, during the course of the bidding, two players make the same bid and it cannot be determined who spoke first, the first player going clockwise from the dealer is considered to have made the bid. Upon conclusion of the bidding, the winner pays the dealer the agreed-upon amount, and swaps hands. If nobody makes an opening bid on the extra hand, nobody receives the hand, and it remains unexposed. The player to the left of the dealer goes first, and plays the lowest card they hold of any suit they choose (aces are high). The player holding the next-higher card of that suit then plays it, irrespective of where they sit. This continues until no further progress can be made in that suit. This happens one of two ways: either because the ace of that suit has been played, or because the next card that would be played is in the widow. In either case, the player who played last plays the lowest card they hold of a suit of the opposite color. If, at any time, a player plays one of the pay cards, they are entitled to collect the corresponding pot of chips from the betting layout. After the first hand, the pots may not be equal due to uncollected chips remaining in them at the end of the hand. If a player fails to collect a pot they are entitled to, they forfeit it. Game play continues until a player runs out of cards, thus winning the hand. All players pay one chip to the winner for each card remaining in their hand. Some pots may remain unclaimed, due to the card associated with them not being played during the course of the hand. This happens because the card either ended up in the dead hand, or because play simply never allowed for the pay card to be played. These uncollected pots remain for the next hand, and all players ante again to each of the four pots. The deal passes to the left, and the next hand is dealt. Keep playing until a predefined time or a set number of hands. The player with the most chips at the end of the game is the winner.